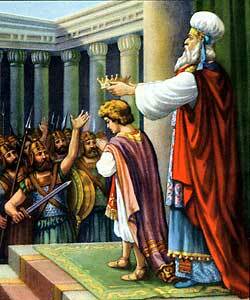 Jehoash is proclaimed king at seven years old. WHEN JEHOSHAPHAT DIED,his eldest son Jehoram became king in Judah in his place. His wife was Athaliah, the daughter of Ahab and Jezebel, and together they did a great many wicked things. Jehoram slew all his brothers in order to get the riches which his father had left to them. He built places in the mountains of Judah and in Jerusalem for the worship of Baal. When he died, after ruling for eight years, his son, Ahaziah, became the ruler. He, too, was very bad, and his rule was a short one. When he was killed, his mother saw that no one was left to take over the throne; so she planned to be the ruler herself. Of course, Ahaziah had some children, who were her grandsons, and she had other grandchildren too, but she decided that they must all be killed so that she could be made queen. Only one of the grandchildren escaped–a tiny baby named Jehoash. He was hidden away by his father’s sister, and he was kept hidden for years, in a set of chambers built round the Temple. Athaliah became the queen, and since she was so willful and powerful, even those who did not approve of her had to pretend that they did. She established the worship of Baal again, and even took some of the Temple treasures and placed them in the House of Baal. Finally the wickedness of the queen and her court became so great that the High Priest of the Temple decided that the only way to save the entire nation from destruction would be to place the young prince on the throne. So after he had made his plans carefully, the Priest of Jehovah called the Guardsmen and soldiers of the temple together. He gave them weapons which had been hidden by David in the Temple. Then he brought forth Jehoash from his hiding place, and the assembled gathering proclaimed him king. Of course, Athaliah was very angry when she learned what had happened, but it was too late. She was driven out of the Temple; and as she was trying to escape, she was killed in the excitement. As long as the Priest of the Temple, Jehoiada, was alive, Jehoash was a good king. He restored the Temple, which had fallen into bad repair through long neglect, and he brought the people back to the worship of Jehovah. Jehoash was seven years old when he became king, and he reigned for forty years in Jerusalem.